I think this photo warrants it’s own post. 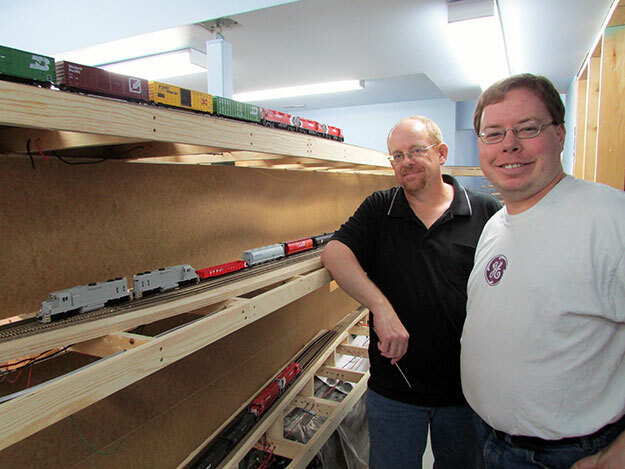 Cam (left) and I standing beside a few trains (Arrowsmith on top, Parksville – complete with in-progress units 3000 and 3004, and Mud Bay below) and looking quite thrilled at the progress made on the layout. Photo undeniably by Jason Shron, stolen without permission from Rapido Train’s blog. This entry was posted on August 6, 2013. It was filed under Unassigned.